During the 2004-05 school year, the Student Task Force focused on putting an end to the use of child labor on the sugarcane plantations of El Salvador. The STF first mission, in partnership with the Salvadoran American Humanitarian Foundation, was to conduct a fundraising and school supply drive that brought in over $1,000 and nine large boxes of school supplies. The STF continued the fight by organizing a child labor art contest and by writing letters to their elected officials, the Salvadoran government, the Salvadoran sugar industry, and businesses like Coca-Cola, who purchase sugarcane that HRW found to be harvested by children. 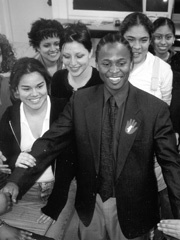 Throughout the 2002-03 school year the STF continued its focus on juvenile justice. 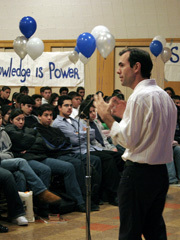 Javier Stauring, HRW Human Rights Honoree, hosted screenings of the film “Juvies” at STF schools. STF students then completed a Christmas Drive for incarcerated youth at Men’s Central Jail. In addition, the STF began to deal with the issue of child laborers in Central American and South Asia. Throughout the 2002-03 school year the STF split its time between the issue of children as soldiers, this year focusing on Burma, and the issue of juvenile justice. To bring attention to the continued use of child soldiers, STF schools placed red hand signs throughout their campuses to mimic tombstones of children killed in combat. 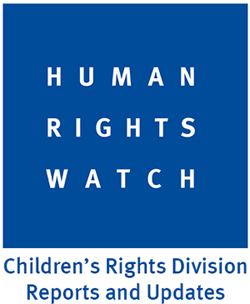 Among other events, the STF hosted a film screening of “Tough On Crime, Tough On Our Kind”, part of HRW’s Traveling Film Festival. The screening, at Fairfax High School, was followed by a discussion of juvenile justice hosted by the STF. 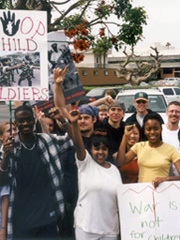 During the 2001-02 school year the STF dedicated itself to the cause of child soldiers. This year the STF hosted Ishmael Beah, a former child soldier from Sierra Leone. 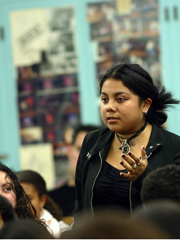 Speaking at multiple STF schools, Beah encouraged the STF to advocate for the Optional Protocol, a treaty to end the forced conscription of children under the age of eighteen. The STF then participated in the National Call-In Week urging the Senate to hold hearings on the treaty. Upon the success of this initiative the STF sent over 2,000 signatures to Senate Majority Leader Tom Daschle urging him to complete the final stages of ratification. In addition, an STF delegation visited the Mexican Consulate in Los Angeles to brief them on the activities of the STF and to thank them for ratifying the Optional Protocol. 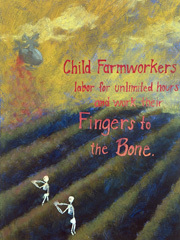 For the 2000-2001 school year the STF focuses on child farmworkers working within our own borders. 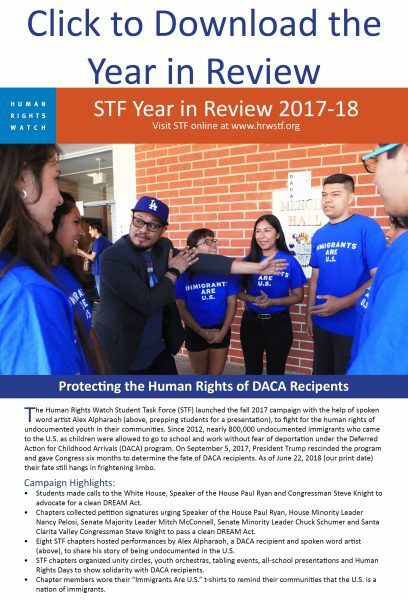 After a meeting from HRW researcher Lee Tucker, the STF pledged its support to help pass the CARE Act, which would extend national youth employment standards to child farmworkers. Throughout the year the STF collected 4,000 signatures in support of the CARE act, organized awareness days, an art contest, a political theater production, and meetings with elected officials, all culminating with a trip to Washington D.C. to meet with Senator Tom Harkin of Iowa, sponsor of the CARE Act. During the inaugural year of the Student Task Force, students chose to work towards putting an end to the use of children as soldiers. Throughout the year the STF organized a T-shirt design contest and sale, introduced the use of green awareness ribbons at local High Schools, and held regular meetings to plan for awareness days, letter writing campaigns, and ultimately a “Walk to Stop the Use of Child Soldiers”. Working in conjunction with their counterparts in the Bay Area, the STF organized the march that took place simultaneously in Los Angeles and San Francisco.